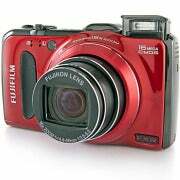 The 16-megapixel, 15X-optical-zoom Fujifilm FinePix F550 EXR ($350 as of 9/7/2011) is the latest model in Fujifilm’s higher-end F series, and it’s appropriately packed with features. In addition to manual, semimanual, and automatic shooting modes, the F550 is one of the latest crew of cameras with GPS capabilities and a long-zoom lens. The F550 fits neatly into the pocket megazoom category of cameras, offering some far-reaching in-camera goodies that will interest snapshooters, photo enthusiasts, and vacationers alike. The F550’s arsenal includes full HD video with stereo sound and autofocus, slow-motion video, multiple bracketing modes, film-simulation options, user-selectable dynamic range, and other appealing features. A trio of EXR modes are geared toward improving image quality in different conditions, and the camera can also capture 360-degree panoramas in one fell swoop. The geotagging-friendly F550 stands apart from its twin, the F500, with one of the best GPS implementations of any camera on the market today. The F550 adds GPS to the F500’s feature set for an additional $20 or so, and it’s well worth the extra cost, even for a once- or twice-a-year vacation. The F550 also offers RAW and RAW + JPEG; the F500 does not. While the F550 has the in-camera features to go toe-to-toe with most long-zoom pocket cameras, image quality may not be on a par with the competition. However, for many users, the F550 has more than enough strengths to compensate for its photo- and video-quality shortcomings. 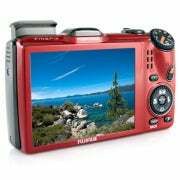 The Fujifilm FinePix F550 EXR is built around a new EXR-branded backside-illuminated CMOS sensor. Like past Fujifilm EXR cameras, the in-camera menus let you select between three special EXR modes that tweak the sensor’s settings to improve image resolution, low-light performance, and dynamic range. Equipped with a stabilized 15X-optical-zoom lens, the F550’s focal range starts at a highly useful 24mm and extends to a long-reaching 360mm. With this kind of lens versatility, the F550 is capable of handling everything from broad vistas to distant subjects. The F550’s multiple image stabilization feature is a combination of sensor-shift (mechanical), high ISO (electronic), and an "Advanced Anti-Blur" that shoots and merges four shots to help eliminate blur and image noise (essentially a bracketing mode). Like practically every pocket megazoom we’ve reviewed, the lens isn’t particularly fast: Maximum aperture settings range from F3.5 wide-angle to F5.3 telephoto. Available in black or glossy red, the F550 is sleek looking and solidly built. The body measures 4.1 inches wide, 2.5 inches tall, and 1.3 inches deep. It won’t slide into tight jeans’ pockets, but it’s compact enough to fit comfortably into more generously cut clothing. It weighs about 7.6 ounces fully loaded. The tiny grip and rubberized pad should provide a relatively comfortable handhold for most shooters, but if your hands resemble catcher’s mitts, try the camera on for size before you buy it. Controls and dials are relatively small, but they’re generally well-positioned for easy access. The F550’s shutter/zoom-control combo sits along the top edge, as does the tiny on/off button. The GPS antenna is nicely integrated into the design--it’s fairly low-profile. To the left of the GPS unit is the pop-up flash, which automatically goes up when the camera powers on; it’s easy to press back into a closed position when not in use. A small mode dial is angled between the top surface and the rear panel, in perfect position to thumb through the various modes. Unfortunately, our review unit’s mode dial was extremely stiff, and it took more effort than usual to move from one mode to another. Other controls include a dedicated movie button, playback, display, and "F" function buttons. 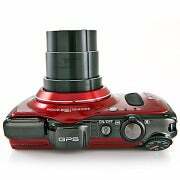 The latter displays a quick menu to change common settings such as ISO and image size, while a four-way keypad doubles as one-touch access to the macro, exposure compensation, flash settings and self-timer. A small command dial surrounds the four-way controller and has just enough tension to keep it from moving too freely. A center menu button calls up the main menu for access to the remainder of the F550’s options. The 3-inch LCD works well under most conditions, even though its 460,000-dot resolution is only average these days. It’s certainly bright enough to easily read menus and review images during playback. A single media card slot accommodates SD/SDHC/SDXC cards. It has 39MB of internal memory as well, but that doesn’t make much of a difference since it holds maybe five high-res images. If you want to view your images and video on an HDTV, a mini-HDMI port is under a door on the side of the camera. The F550’s core shooting modes include Auto, Program, shutter priority, aperture priority, and full manual mode. As expected, there are a number of scene modes, including the standard portrait, landscape, sport, night, sunset, beach, and the like. A special underwater mode is available for shooting with the camera’s separately sold underwater housing (the camera also has an underwater white balance option). In a unique Pets mode, used in conjunction with the auto-release self-timer option, the camera automatically takes a shot when it detects a pet. Like most cameras’ face-detection modes, though, the pet has to be facing the camera--which is sometimes easier said than done. The final two options on the mode dial--Advanced Mode and EXR--are reason enough to reference the user guide. Advanced Mode offers three options: Motion Panorama 360, Pro Focus, and Pro Low Light. Motion Panorama 360 is easy to use once you get the hang of how to pace sweeping the camera across a scene, and it works quite well. Another useful feature is the "Pro Focus" mode, which captures multiple shots, producing a soft background while keeping the main subject in focus. The amount of focus is user-adjustable and works best for portraits and macro shots. In "Pro Low Light" mode, the camera captures four exposures and merges them into a single photo to help prevent blur and image noise. This is probably the weakest of the three advanced modes, as its success depends greatly on the shooting conditions. The EXR modes start off with Auto EXR, in which the camera analyzes the conditions and selects the most appropriate scene mode. Other choices include Resolution Priority (for the cleanest, sharpest images), High ISO/Low Noise, and Dynamic Range (which can be adjusted). The latter two cut the resolution to 8 megapixels, but that might be worthwhile, as both modes work well. Continuous shooting is peppy: 8 frames per second at full resolution, and the buffer tops out at 8 photos. Higher speed capture of 11 fps up to 16 frames is possible at 8 megapixels; at a 4-megapixel resolution, the F550 can capture up to 32 frames at 11 fps. Shot-to-shot time was nice and quick for JPEGs, but you may have to wait up to 4-5 seconds for the beefier images to save when shooting RAW. Video options range from 1080p full HD at 30 fps to silent movies shot at 320 fps at 320-by-112 resolution. There are also a number of video settings in between. From 1080p to 640-by-480 VGA at 30 fps, the camera records stereo sound. The slow-motion movies are fun but, as with similar slow-motion options, the footage is tiny and best viewed on a computer screen. Center or continuous autofocus are both available in movie mode; the zoom is also operational, albeit with slower zooming to cut down on noise. The F550 offers a number of other attractive options including a search function, which can locate images by parameters such as the scene mode used and the location in which you shot them. Overall, the camera is fairly easy to operate, but some of its options are best understood by reading the user guide. The GPS capabilities are one of the major highlights of the F550, as they’re more extensive and useful than your average “add geolocation data to EXIF” feature. Reading the user guide is especially helpful here, as there are a number of geotagging options. The GPS can be set up to show just latitude and longitude, but also has an option to use an embedded database to apply real-world location names within the camera. When you're playing back images, the camera can also calculate how far you are from the place the image was taken. On the desktop side of the equation, you can use the included, Windows-only MyFinePix Studio in conjunction with Google Maps to see the route you traveled. All in all, the F550's in-camera GPS options run circles around those we've seen in most models, except for one: the Casio Exilim EX-H20G, which has in-camera mapping and some similar location-name and distance-calculating features. The F550 is the closest we've seen to matching it, however. Of course, if the GPS is left on all the time--even when the camera is turned off--it will drain the battery. The better option is to have the camera search for a satellite signal each time you power it on; it can take a minute or two, but the battery will last longer. In PCWorld Labs’ subjective tests for image quality, the FinePix F550EXR fared well, but its overall imaging score trailed competing pocket megazooms such as the Nikon Coolpix S9100 and Canon PowerShot SX230 HS. Lack of image distortion was a notably strong suit given its 15X zoom lens, as the F550 earned a score of Very Good in that category--the best among competitors. Image sharpness was also rated as Good, besting the Coolpix S9100 in our tests. However, it lagged a bit behind the competition in color accuracy and exposure quality, although it did earn scores of Good in those categories. In my hands-on tests, I also found image quality to be hit-or-miss. JPEG images straight out of the camera looked a little soft, and image noise was visible in shadows even at low ISOs. On the other hand, some night-time test shots at higher ISOs looked surprisingly good. Colors are generally rendered naturally, and exposure is accurate more often than not. Kept at reasonable sizes (8 by 10 and below), prints from the camera look quite good. The camera is also fairly responsive. Given enough light and contrast, autofocus is fast and accurate. The zoom moves smoothly through its 15X range, and the sensor-shift image stabilization works well. However, in low light, it’s best to use a tripod for telephoto shots. You can view the full-size images used for PCWorld Labs’ testing by clicking on the thumbnail images at left. With video, the FinePix F550 wasn’t as competitive. The camera earned a video quality score of Good in PCWorld Labs’ subjective tests, but its aggregate video score was noticeably lower than that of the Coolpix and PowerShot cameras mentioned above, and was little more than half the score of the video-friendly Sony Cyber-shot HX9V. The FinePix F550’s video quality is noticeably inferior in low-light situations, with a bluish tint and murky contrast in our test footage. In our low-light test, you couldn't see much of anything. Audio pickup is decent--if a bit tinny sounding--out of the camera’s stereo microphones, and its audio capture earned a score of Good. You can view the test clips used for our subjective video tests below. Select 1080p from the drop-down menu in each player for the highest-quality footage. Battery life is just about average, with a rating of 300 shots per charge of the camera’s lithium ion battery--and that’s with the GPS turned off. That translates to a battery-life score of Good in the best-case scenario. The Fujifilm FinePix’s F550 feature set varies from the pocket megazoom norm, and that’s largely a good thing. You don’t have to understand how some of the special features, such as the EXR modes, work; you only have to figure out how and when to use them. The F550’s GPS features are also among the best we’ve seen in a camera yet, as they take GPS further than just longitudinal and latitudinal EXIF data. With so many features, the F550 is priced right for snapshooters and enthusiasts. You may have to compromise a bit on image and video quality compared to long-zoom compact cameras such as the Nikon Coolpix P9100, the Sony Cyber-shot DSC-HX9V, and the Canon PowerShot SX230 HS, but the Fujifilm FinePix F550’s feature set gives them a run for the money. The 15X-zoom FinePix F550EXR has GPS features and in-camera extras that go beyond the norm, but in image and video quality it lags a bit behind competitors.